You work hard to get your look right. Ensure a flawless finish that lasts with the power of this setting powder from Kat Von D.
A loose powder, formulated with Micro-Blurring Technology™, that sets and perfects for a flawless, locked-in finish. 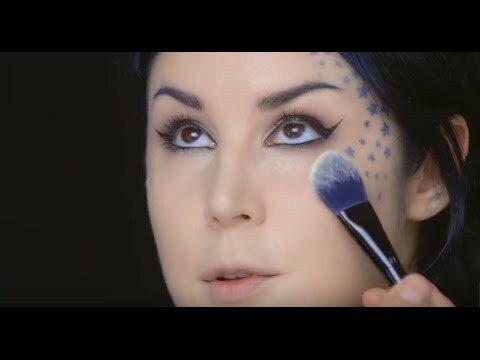 Unlike other powders that use heavy, chalky binding ingredients, Kat Von D’s setting powder uses fine mica powders to bring you a formula that is 30% lighter. Bid farewell to the dry, chalky finishes most powders leave behind, and say hello to the perfectly smooth, seamless look brought to you by this next level setting powder. Featuring Micro-Blurring Technology, this silky, non-drying powder softly diffuses pores for a refined finish. Undetectable on all skin tones, Lock-It Setting Powder boasts a complexion-boosting blend of mattifying particles that smooth imperfections and lock-in your makeup for a velvety finish. Inspired by Kat's signature star tattoos, the jar's sifter holes are arranged in the shape of a star. This product is completely free of animal-derived ingredients. Lock-It Setting Powder is rated 3.8 out of 5 by 8. Rated 2 out of 5 by Brinda from Very bad I dislike this powder so much. It’s too heavy, not fine at all. Leaves your skin looking cakey and accentuate your pores and fine lines. Wouldn’t ever purchase this product again. Rated 5 out of 5 by Anonymous from Love it! This goes on beautifully, very matte and long lasting! I love the translucent of this powder it does not leave a white residue look and feels light weight. This is one of my favorites setting powder! Rated 4 out of 5 by Nuha from Haye\\Love relation ship I love this powder for my skin! it's very luminous and light but it would not work on the under-eyes bc it creases. I would recommend this for people with normal\\combination skin. Rated 1 out of 5 by Sondos from Not good It’s nice but very bad also. I havr dry skin and it crack very fast, has a wihte colore that shows on the sking, and break out it humid and normal weather.. Rated 5 out of 5 by Hamda from Worth the purchase! I've tried this setting powder for almost a month so far, and I have to say that it is an amazing powder, very light textured and finely-milled, unlike Laura Mercier that has a bit of a thicker texture. KVD mattifies the skin without making it look lifeless or flat, and most importantly, it is flash photography friendly! Just make sure to not go overboard with it. Rated 5 out of 5 by Anonymous from Great purchase. Really Recommend it! Amazing product! Fell in love from the first time I used it... Really love Kat Von D makeup, they are really good quality and I think she has outdone herself with this powder. It isn't cakey in anyway nor does it change the color of the concealer and it is super easy to apply, you can apply it with a sponge or a powder brush.